The Favorite Albums site for 2017 is a continuation of last year’s exploration (and, in fact, of our long term interest in putting together year-end lists of music). 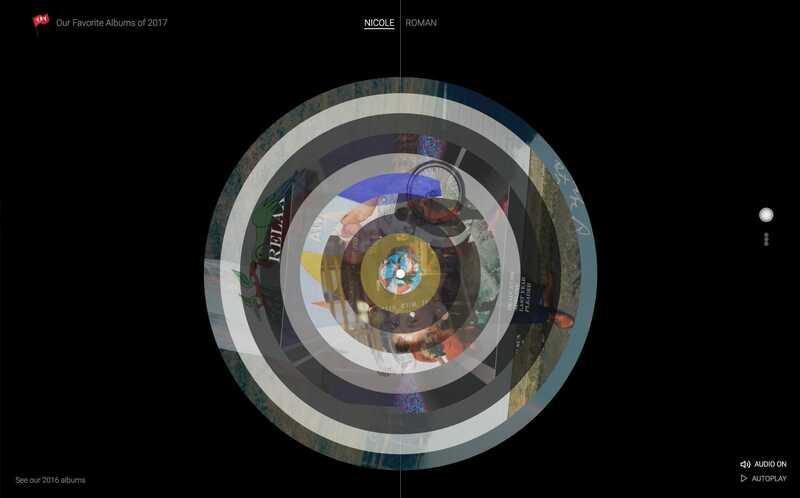 Last year’s site started with an exploration of overlapping, rotating spheres which contain the album cover art. It was designed entirely in-browser, so the design and functionality slowly grew out of the experimentation. This year, we added an option for another view: users can toggle between a ‘nested’ view and a ‘stacked’ view of the records. Also new is the ability to hear a small sounds sample when hovering over an album. We used howler.js for dealing with sound, which worked out quite nicely.